Like millions of other men across the world, I truly look forward to Father’s Day. It’s a great event for me, as I get to celebrate being Hollianne’s husband and the father to our three children. This year brought a special surprise. Our youngest child presented me with a gift that I’ll never forget. Britton obtained a paisley-patterned tie for me to wear. While the tie was wonderful, it’s what Britton did with the tie that made it extra special. Britton took brightly-colored paint pens and personalized it! 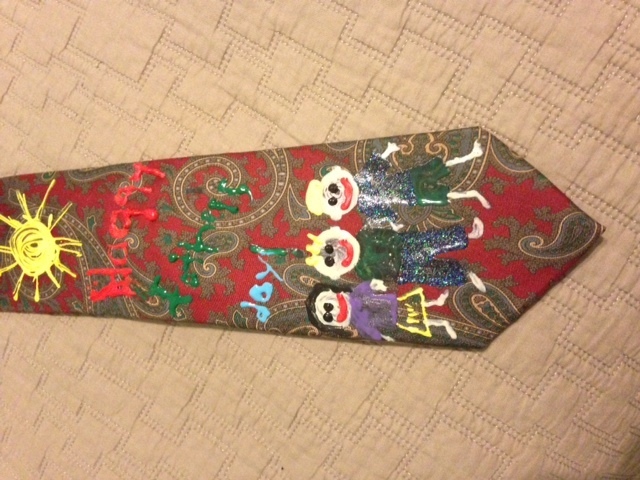 He drew three children on the tie (representing the Carver kids) and wrote “Happy Father’s Day” across the top. He proudly told me that it was the only one like it in the world…it was unique. He beamed with pride when I wore it to church that morning. Just like my special gift from my son, we as Christians should celebrate our uniqueness. We are carefully made by God our Father. God knows everything about us. He knows our strengths and shortcomings. He knows our past and our future. He uniquely made us for His service. I cherish my Father’s Day tie…and am so thankful for the son who created it for me. But we are infinitely more cherished by our heavenly Father, and I pray that we will all continually work to use our unique gifts and talents to glorify His holy name. I had the honor of a lifetime late last night. 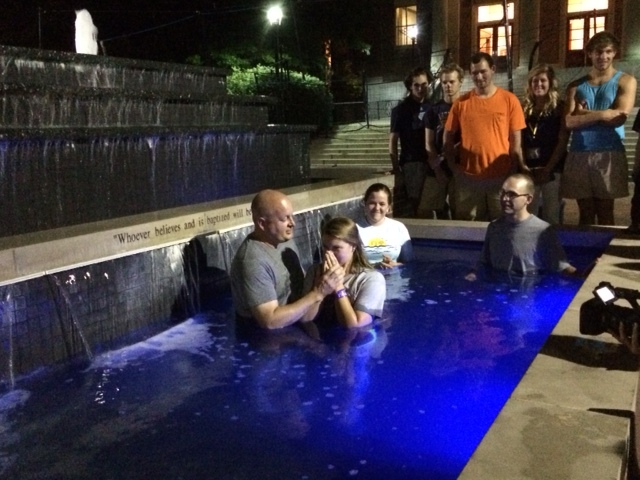 My daughter, Carson, called us from church camp in Nashville to let us know that she was ready to accept Jesus as her Savior and be baptized for the remission of her sins. Hollianne and I rushed over to middle Tennessee to be a part of this special event- and I even had the great honor of baptizing my little girl. We are born sinners, but we do not need to die in sin. The death of Jesus on Calvary’s cross has blotted away our sins- and has cleansed us from the inside out. True cleansing comes from within. It’s a matter of the heart. We experience grace and salvation through contact with Christ’s blood. Our transgressions are blotted out…our sins are forgiven. What a glorious gift. I told Carson last night that her obedience and outward commitment to God had given us a new relationship. She woke up on Thursday morning a daughter, but she went to sleep as my sister in Christ. What a great feeling. God bless. day, whether it’s from work, home or society. through life’s valleys. We’ve been promised comfort and help. What a blessing! Can you imagine how Joshua must have felt upon hearing this? Moses has just died and Joshua has been chosen to finally lead his people into the Promised Land. Joshua knew that this part of the journey would be filled with conflict and fighting, but God was with him- and the promises He had made years ago to Abraham of obtaining a land, a new nation and a blessing (Genesis 12:1-3) were finally coming to fruition. After years of wandering in the wilderness, the Israelites were to obtain their home. God keeps His promises to us today- just as he did to Abraham and Joshua. His promises are realized today and will be here tomorrow. We must be faithful, diligent and bold- because we have been promised that “the Lord your God is with you wherever you go.” Let His light shine within and around you today. Be bold and confident. I was hit this morning in Memphis. I was stopped at a traffic light along Riverside Drive. I casually glanced up at my rear-view mirror just in time to see a red Toyota compact bearing down on me quickly. The driver was obviously distracted, probably checking her iPhone for a text message or changing her radio dial. I braced for the collision- knowing that the impact was only moments away. The driver looked up at the last instant, applied her breaks, and then slammed into my bumper. Before I could gather my thoughts, the light turned green and traffic started moving again. The driver behind me had her head in her hands- looking straight out her winshield to survey the damage to her hood. I slowly moved forward and looked for a place to pull over. I turned on my signal to indicate a right-hand turn on Jefferson Street, hoping that the lady behind me would follow. I wanted to make sure she was o.k., survey the damage to our vehicles, and exchange insurance information if necessary. I was glad to see that she had decided to follow me on Jefferson. I looked at her car in my rear-view mirror, but I could not see the severity of the damage. I looked for a good place to pull over and moved toward a lane of parking meters. Unfortunately, the woman behind me quickly changed her mind….turning and making a hasty retreat back toward Riverside Drive. She made a quick right-hand turn and was gone in an instant. Why did she drive off? Why wouldn’t she want to see if I was o.k.? Why wouldn’t she want to immediately check on her car? My shock soon turned to frustration. My truck was o.k. (just a few scratches) and more importantly- I was o.k. I’m sure that her grill and hood were extensively damaged. I thought about this incident- and the woman involved- all morning. Why did she drive away? She was obviously scared. Scared of my reaction. Scared to look at her car’s damage. Scared to look at the damage to my truck. She had a split decision to make a decision- and she decided to run. Away. Afraid. My frustration turned in to sorrow later in the day. Did she not have insurance? How would she pay for the damage to her car? It made me think about how many times have I participated in a ‘hit and run’ in my daily life. I have sprinted away from a relationship that desperately needs repair. I’ve ignored someone who desperately needs help- but it’s out of my comfort level to lend a hand. I make sure that I get in that last, painful verbal shot during an argument and walk away. I know that I fail others each and every day, and I pray that I can take a lesson from the accident this morning. We are all going to fail. All of us fall short- even on our best of days. The true test of character, however, is how we respond and learn from our mistakes. Our eternal Father offers us a sense of peace if we are willing to own up to our mistakes, confess our transgressions and work to become a more complete person. He offers us a fresh start each and every day. I’m sorry that I reacted the way I did this morning. I pray that the woman who hit my truck is o.k. I also pray that the next time I am faced with an opportunity to ‘hit and run,’ I have the courage, wisdom and strength to make the right decision. Have a good day- and God bless. Carson, our daughter, was excited about her freshman year of high school basketball. 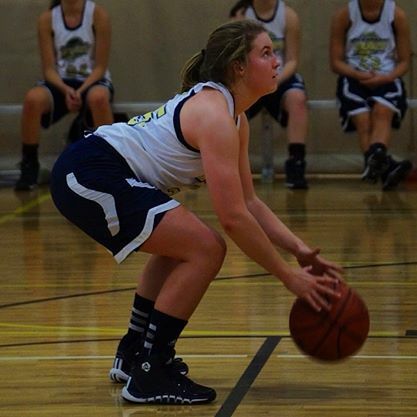 She worked hard all summer on her conditioning and shooting, and she was able to secure a spot on the varsity team. By late September, however, Carson developed an injury in her foot that required her to miss the entire season. She was crushed- all that time preparing over the summer was wiped away with one trip to the orthopedist. Carson struggled for a couple of days, but her mood eventually changed. Determined to be on the court in some way, she decided to help coach a basketball team of second grade girls. She immersed herself in drills, motivational ploys and teaching the basics of basketball. Her crew of young players had a rough start, losing their first three games. But Carson was determined to make this thing work. And they all improved…the girls became better players and Carson became a better coach. By midseason these young women had turned into a confident, skilled group of players. They improved each game and eventually made a deep run in the city recreation league championship. Best of all? Carson had channeled her frustration into an opportunity to continue with basketball- and make a positive impact on the lives of some special kids. She turned her hurt into something good by attempting to help others. Endurance. Patience. Persistence. May you never “tire in doing what is right.” God bless. It had been a really tough week. One of those weeks where I felt intense pressure to get a huge project off my desk and I only had a couple of days to make it happen. I had been in the office late for several nights in a row. Tim, our nighttime facilities worker for the building, must have noticed the stressed, hectic activity over the three-day span. Usually conversational and engaging, he simply cleaned around my office and generally left me alone. This was fine with me, as I needed to press forward as quickly and as focused as possible. This sort of thing certainly wasn’t in Tim’s job description. But Tim noticed that I was rushed, stressed and probably not that pleasant to be around. This one simple act of kindness changed my whole outlook on the project- and especially my day. We are often consumed with our own projects, worries and thoughts. I pray for increased awareness to look around me and see how I can help others. It’s not always in those big, courageous acts either. We can lift the spirit of another with a simple, unspoken action. May we all be made aware of opportunities for kindness to others. God bless.